What does this type of thing say about your organization? Now, imagine for a moment that you actually had a compelling and pressing reason to identify customer parking versus that of employees, etc. Imagine that instead of hiring Highway-Paints-R-Us to do the above displayed botch job, you actually hired local graffiti artists who have a passion for what they do. 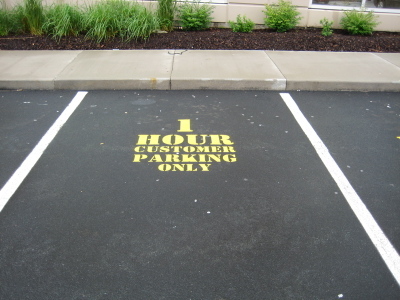 And then, suppose that you simply asked them to make every customer parking space look different / cool / interesting. What would that say about your organization? How you do the little things says a lot about how you do the big things. It really is just that simple.